I've been playing with a few of the new Unity releases this week! They're not available *quite* yet, but they should be soon! The first three (I know! THREE!) 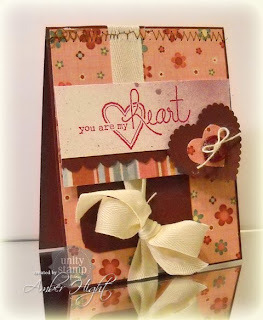 cards are using stamps from a gorgeous, fun new kit called "Lovely Bits & Baubles" It's got some fun heart images, a flourish, fun sentiments, and a couple heart border stamps! Doncha love it? 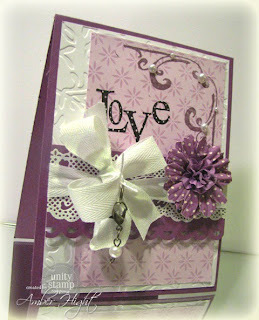 This purple card is for this weeks sketch challenge on SCS and Melissa Phillips' inspiration challenge! I know I threw alot at ya, so I won't bore you with all the teeny details;) Make sure you head over to the Unity blog to find out what kind of sales and FUN Angela has planned! She'll also have a list of all the girls participating today:) Hope you have a fantastic day! Well, long time no blog:) I'm neck deep in work these days so it doesn't leave much time for crafting! We have our big hospital inspection next week (the one that accredits the clinic, if you are in the medical field, you feel my pain!) so we have been super busy at work making sure we're ready! I think we'll do fine, but it's still nerve wracking, I HATE inspections! Okay, well I had to get crafty for a bit tonite, I miss it if I have to skip a day or two! My day just doesn't seem complete until I get a card made, ykwim? 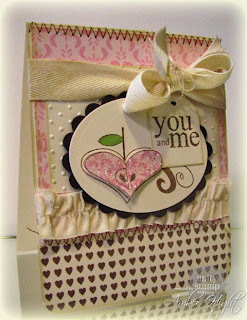 My card base is Pretty in Pink cardstock, stamped with a background stamp from Background Basics: Flower Power by PTI! I stamped it in Pretty in Pink so it would leave just the slightest bit of a pattern. Next, I added my Blush Blossom piece, and layered some hearts on top! 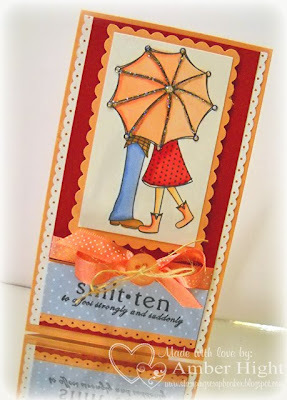 The sentiment stamp is by Verve, it's the "Be Mine Plain Jane, "totally fun stamp with a totally fun font! I also added a Hambly sheer frame, buttons, twill tape, a fun crystal pin, and a sticker from Heart Warming Vintage by Crafty Secrets! Jessica is here to STAY! WOOHOO! Jessica Diedrich has been the Unity guest designer for the past couple months and we are SO excited that she's going to stick around on a permanent basis as a Unity ROCKSTAR! Isn't that awesome? She's really a perfect fit, love that girl! AND I'm excited to announce that I get to MEET her next month! EEEEKS! I'm going to her neck of the woods for a conference for work and I'm thrilled that she lives so close, yippppeee! Welcome to the fold Jess! 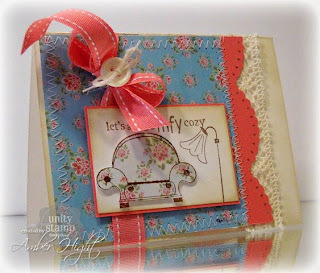 The dp is Garden Party by MME, LOVE this paper! I also spritzed some Pashmina glimmer mist on the sentiment panel. It's really sparkly IRL but didn't come across at all in the photo! I tied some twill ribbon around the card front and tied that in a cute little bow and added the scalloped heart (EK Success) embellishment to the front! 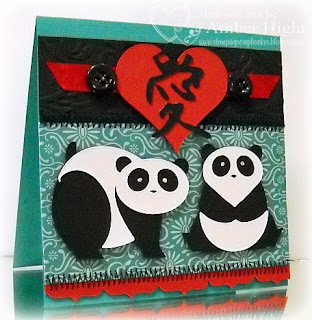 Today's Monday Challenge is Valentine's Day cards! Super simple since I'm ALL about Vday lately! I paired this challenge up with the CAS challenge this week! The title of today's CAS challenge on Splitcoast is "It's the REAL deal" but since the challenge is to use teal, white, and one other color, I thought "TEAL deal" sounded better, heehee! Christy was over stamping at my house today, we had so much fun! She brought over some of her cricut carts and we cut bunches of fun stuff out! 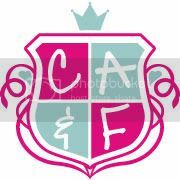 I'll get to my Cricut card after my CAS card! I told Christy to tell me when to stop because I really have a hard time with CAS. Well, she didn't want to let me add buttons, but I couldn't help it! I don't think it makes it less "CAS" either, at least I hope not:) Hey, for me, this is CAS baby! How fun are those pandas? I so love them:) The kanji writing on the heart says "Love" and that's also on the Pagoda cartridge (the heart is from Plantin Schoolbook). I did a little sewing, added some ribbon and buttons, and an edge punch and finally got a card I love:) I'm happy I got it done too, cause I promised Christy I'd post it today, rain or shine! Okay, I have another card! Yes, I made three today, I was on a roll, lol! This one is for Karen's Sweet Sunday Sketch Challenge! This was a totally fun sketch, I'll be using it again! 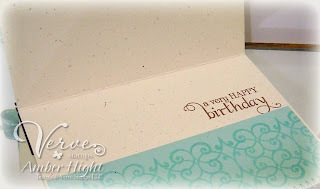 I used the Shanghai digi paper kit by Designer Digitals for the paper. I printed it out on Epson Matte photo paper. Verve Release, Viva la Verve, and Dirty Dozen! Here are a couple cards I created with them! 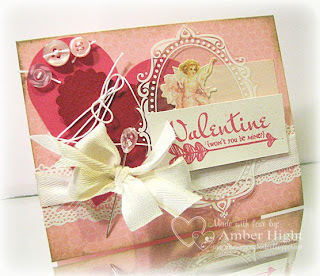 This is using the two new Plain Janes, Heart Flutter and Valentine Be Mine! 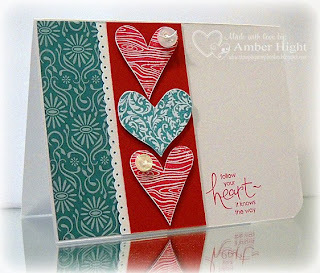 That fun triple-heart stamp on the background is from Heart's Desire. Head on over to the Verve Store and shop your little hearts out! If you shop before 31 January, you can get ALL the new releases in a bundle for a discount!! This week's Viva la Verve challenge is also up! 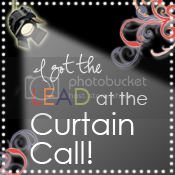 Click >>>HERE<<< to see the challenge! 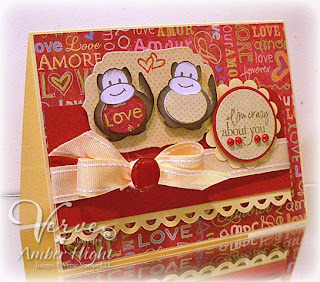 Sneak Peek Day 1: Love Monkey! 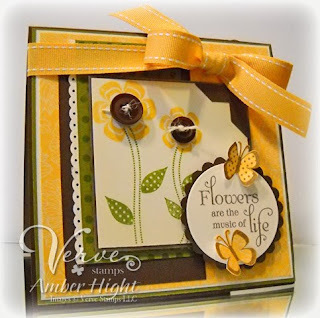 In case you weren't aware, Verve Stamps is having a gorgeous release this coming Friday! 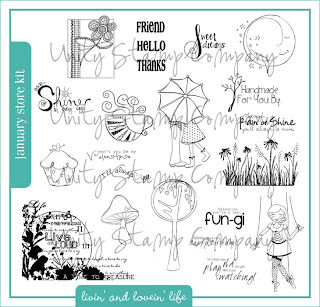 5 new stamp sets and two new Plain Janes, yeah! 3D Challenge! All giving you the opportunity to win Verve goodies! If you complete all 5 challenges, you go in the hat for the entire release:) SWEET! 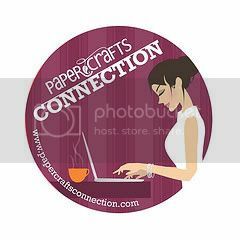 Head on over and join in the fun;) As always, Verve stamps are NOT required to play along so bring what you got and get to stampin! CAS? I don't think so. So the Monday Challenge between AJ, Maren, Jimmi, Jeanne, Brooke, and Jen Buck was "CAS" style cards. Well, for one, CAS is sort of a curse word on my blog. It just doesn't happen often...and it's sort of against my religion! BUT I was really going to try. Really I was! 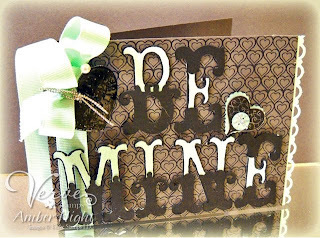 My card was just going to spell "Be Mine" with these super cool letters cut from my Storybook cart for my Cricut and that's it. 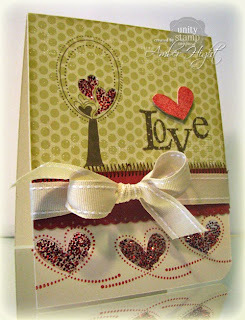 Well, then I decided to emboss some hearts from Hundred Hearts (Verve) on the card base...add some ribbon...some bling...some silver cord...and there goes CAS, flying out the window! 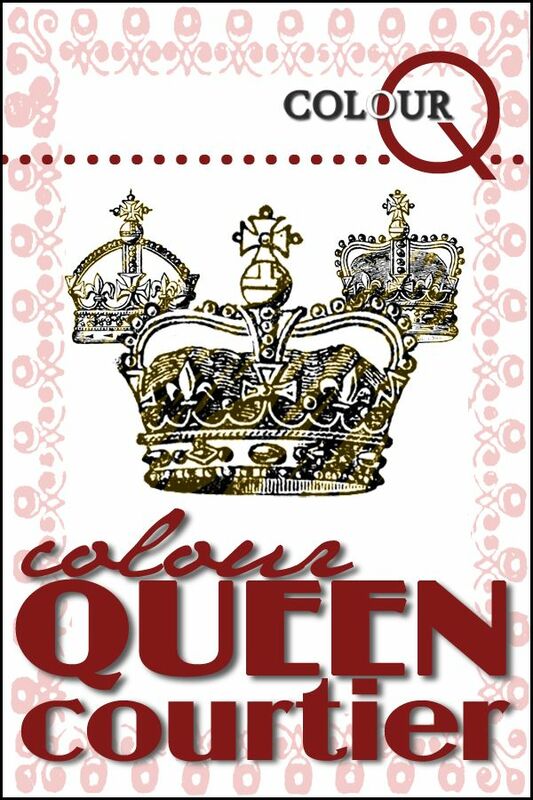 Anyways, this card is also my sample for my color challenge this week for the Verve January Release Week challenge! You simply MUST come play with us this week! There are FOUR other challenges posted! 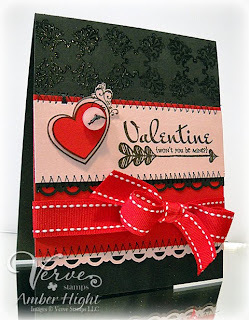 You have until Friday to get your cards uploaded and you could win some SERIOUS Verve loot! Hello! 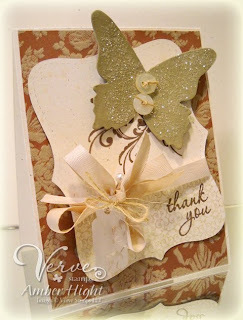 Thanks for popping by my blog today:) I have been crankin out lots of DD and new Verve stamps (released this coming Friday!) 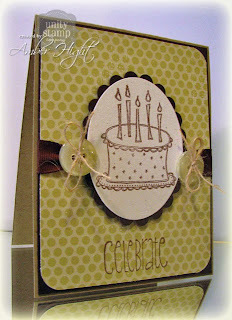 cards this weekend but couldn't resist the chance to play in today's Featured Stamper challenge! I chose THIS card by Weebeestampin. I love the top note die by SU! and don't use it often enough so I used her card as my inspiration! 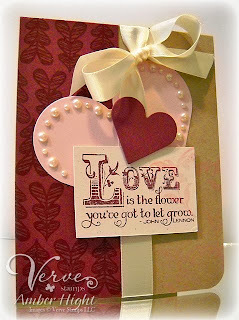 The card base is Rustic Cream by PTI and that luscious paper is by Laura Ashley. It's FLOCKED! I got two yummy packages of this paper from Emma's Paperie. SO gorgeous! 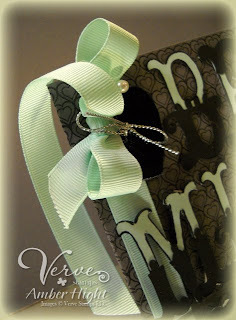 There is a little acrylic tag hanging from the bow, that's by Making Memories! I gotta tell you I've been channeling my shabby muse and it feels great:) Don't be surprised if you see alot more of this in the future! That's what I am, with this month's Stampin' Store Kit, Livin' and Lovin' Life! Aren't those stamps the cutest things ever? I can't think of ONE that I like just a little, I love them all, A LOT! I colored them in with Copics *and I totally meant to take a picture of the colors but I got carried away and cleaned the mess up before I took this picture so I don't have any Copic pics:( The sentiment is from the December '09 KOM, Delightful Moments, which is now available for purchase under the "Past KOM's" tab at the Unity store! Hop on over to Angela's Blog to see a list of all the DT girls using the Store Kit today! To get your own kit, click on THIS LINK and scroll to the bottom. You'll find an HUGE list of all the lovely stores you can buy this kit, Happy Shopping! Hiya! Just a quick little reminder that the Viva la Verve, January Week 2 sketch challenge has been posted! See the Verve member forums on SCS or the Verve Blog for all the deets:) Hope you can play along with us! 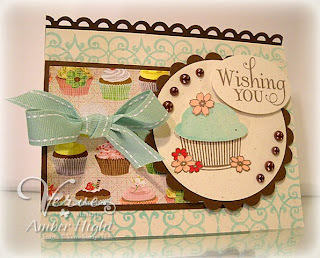 This is my submission for this week's Sketch Challenge #262 on Splitcoaststampers! The paper is from the Green Woodland Collection by DCWV. I colored the owl and flowers with Copics and then went over them with Angel Wings Shimmerz! I'm still on the mend from my killer cold so I'm keeping this short and sweet:) Have a great day! Welcome to the Skipping Stones Design Blop Hop sponsored by Skipping Stones Design. Angela was sweet enough to extend an invitation to the Splitcoast DD/DDA to participate in this month's hop and after I saw her ADORABLE stamps I signed up! If you've just happened upon my blog, you can CLICK HERE to start from the beginning at Skipping Stones Design. 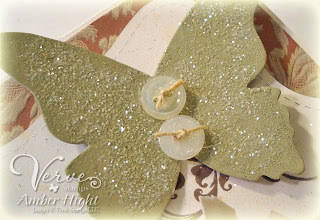 You should have arrived here from Sweet Latisha's blog! I got to play with the NEW, NOT-YET-RELEASED set called "Coffee Vol. 1" and it is SO CUTE and totally ME! Seriously, this is what I look like in the morning, lmbo! Isn't she so cute? I colored her with Prismacolor pencils and Gamsol! I stamped the large coffee cup in versamark on the card base but it's kinda hard to see it in the picture:( I love the sentiment! It's my motto, lol! Okay! Off you go to Peggy's Blog for your next round of eye candy! Along the way, the Skipping Stones Design Team will have blog candy for you to enter. As an added bonus, there will also be 4 stamp sets (new stamp sets not yet released) hidden along the hop, but we’re not telling you where so be sure to leave some love as you hop!!! Make sure you leave comments on every post so you have a chance to win!! The winners will be announced on Friday January 8th at Skipping Stones Design. Along with all THAT, the Skipping Stones team sent me "Blocks and Borders-Swirls " to give away as blog candy today! So leave a comment here and tell me what your favorite SSD stamp set is and I'll draw a name on Friday for the lucky recipient! The Monday Chicks are makin' birthday cards today! A new year brings new birthdays (my 30th is coming this year, eeeEEEEKSSSSSSS!) so it's always good to stock up on the cards! I played with last weeks Mojo Monday sketch, Mojo119! 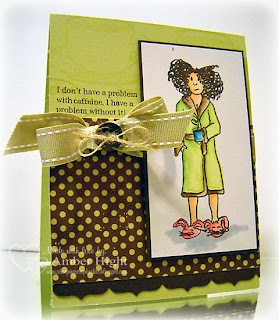 I pulled out some Nook and Pantry paper and my Verve Stamps and got to work! Hope you have a fantastic week, see ya later! 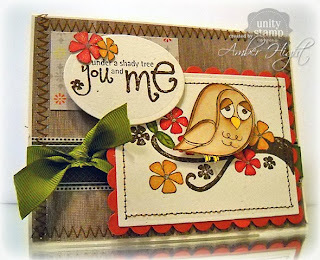 I have a Unity card to share today, it's for todays Inspiration Challenge on Splitcoast! ACK! 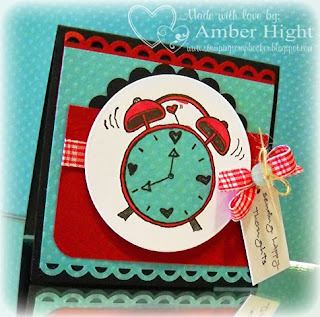 I love that clock:) I hate alarm clocks, but I love alarm clock stamps made by Unity, lol! I've been typing this same information on the Verve forums and Verve Blog for over an hour so this is going to be short, lol! I wanted to make sure you know that the 2010 Viva la Verve challenges have begun! See THIS THREAD on the Verve Forums for the sketch and all the deets! I used an old favorite that hasn't seen any ink for quite awhile, Petals and Stems! Hope you have a wonderful New Years Day!